Nyan Cat is the latest graphical meme to hit the interwebs. It’s dumb, silly, nonsense fun watching a pop tart cat make the same motion. Then someone decided to pair it up with an equally mindless song and next thing you know, 20 million views on YouTube happens. Now that it’s popular, of course a copyright claim is going to happen. And BAM! Sunday night, it got pulled off YouTube. 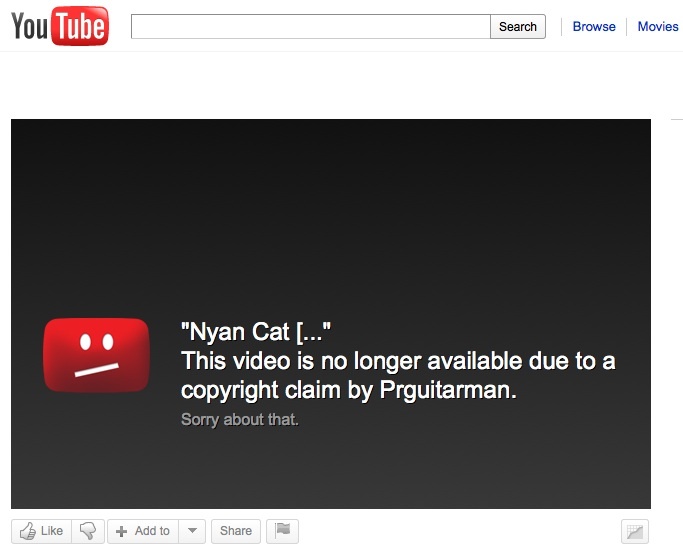 As it turns out, Prguitarman didn’t issue the copyright claim. From his blog, he posted about how he was trying to prove to YouTube that the proper rights to use the song and video were valid. And therein lies the issue here. YouTube, needing proof from the original copyright holder of something that was his, accepted a copyright claim from someone claiming to be this person. It seems things are a bit out of control at the helm of the “all things cats” video site. While I am all about the person who owns the copyright getting their fare share (and any monetary dues), it seems the be ok that anyone can file a copyright claim and have a video pulled, but when it comes to the actual person who owns the copyright trying to get his/her work restored, they need a mountain of paperwork that needs to be submitted. As of Tuesday, the original video is back and all seems to be ok for now. But this case just proves that something with online copyright management needs to change, and for the better. I’m still trying to figure out how this got 20 million views. It’s cute for 5 seconds, then just annoying. I do agree with you about the copyright situation, though. I haven’t run up against any problems as yet, but if I ever do I hope the situation has gotten better. Yeah, 20 million is a lot for a 3 month old YouTube video. Yep, yep on the copyright laws. Nah, no cave living for you. This video hasn’t been around long. My wife’s granddaughter loves it and it’s fun to watch. I was intrigued by the whole copyright issue. I haven’t checked out Nyan Cat yet but I will. What a joke all this copyright stuff is. Seems awful silly to me. It is silly and I think it’s one of the things that will harm online video distribution to a degree.